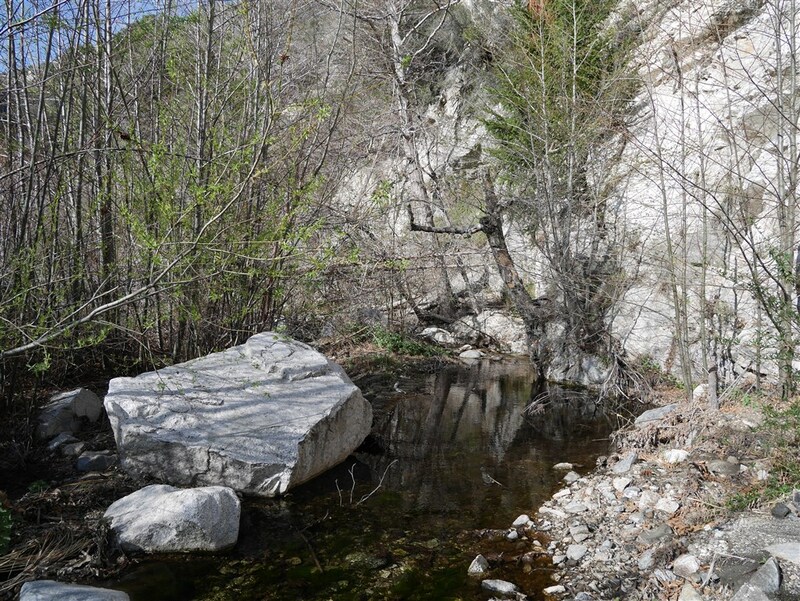 My last hike in Devil’s Canyon was back in February of 2012. On that day, I was with a group of people and we had the rare experience of hiking back up the canyon; first in a rain, then hail and finally snow. Being a down first variety hike and having enjoyed that past experience which diminished the impact of the uphill climb to the finish made the thought of a typical hike uninspiring. So, I stayed away. 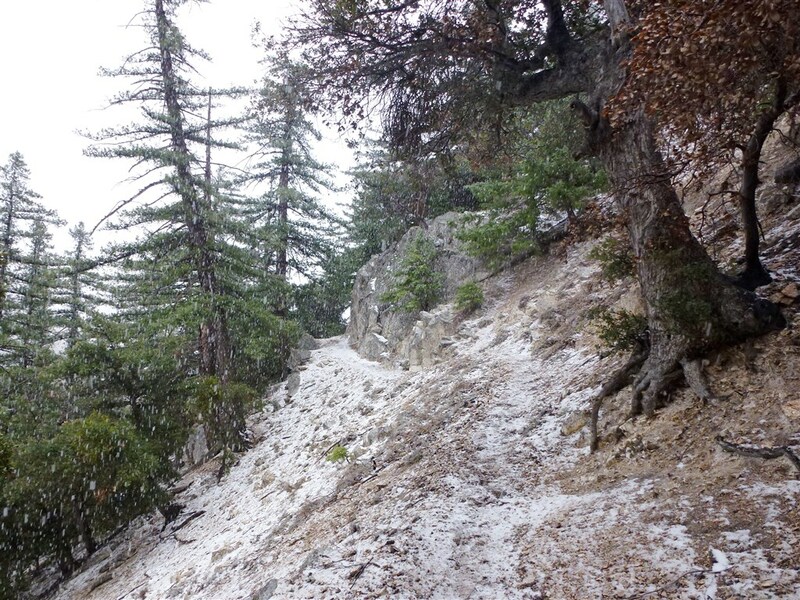 Precipitation turned from rain to hail and then snow as I left Devil’s Canyon in February 2012. Prior to this trip, I had only been down the canyon twice before and both times I stopped at the trail camp–which is the last point shown on the map I use most often. 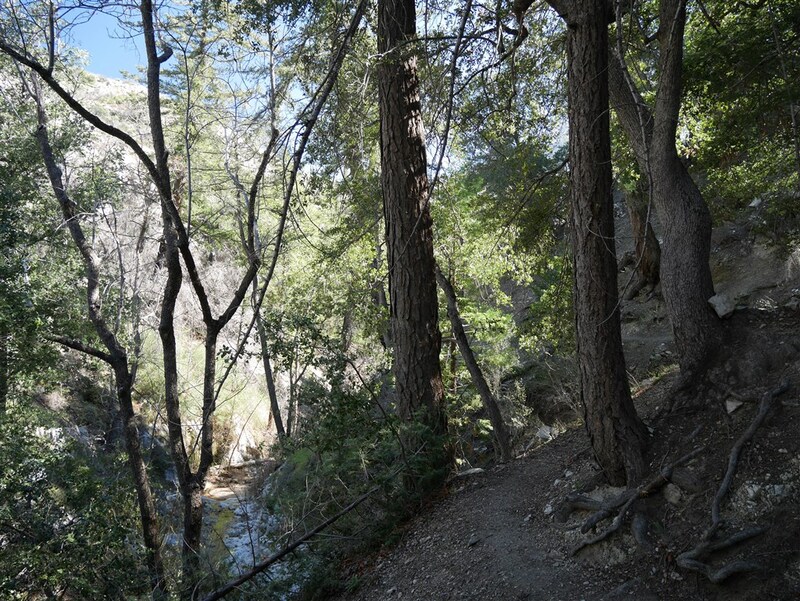 On both occasions, I thought about how the trail appeared to continue down the canyon beyond what was shown on the map and I put it on my hiking “to do” list to return and see what lies beyond. Looking to ramp up the distance and elevation gain of my hikes more slowly than last year and hopefully avoid another re-injury, the prospect of Jerry Shad’s description of a fairly idyllic mid-range distance hike to a waterfall with some boulder hopping sounded very appealing — even though it was obvious to me on the front side that I might not be able to make it to the falls1. Evidence of trail maintenance in several spots (like cutting a notch out of the tree in this photo) and lack of poodle-dog bush make the trail down to the camp easier to traverse now compared to 2012. 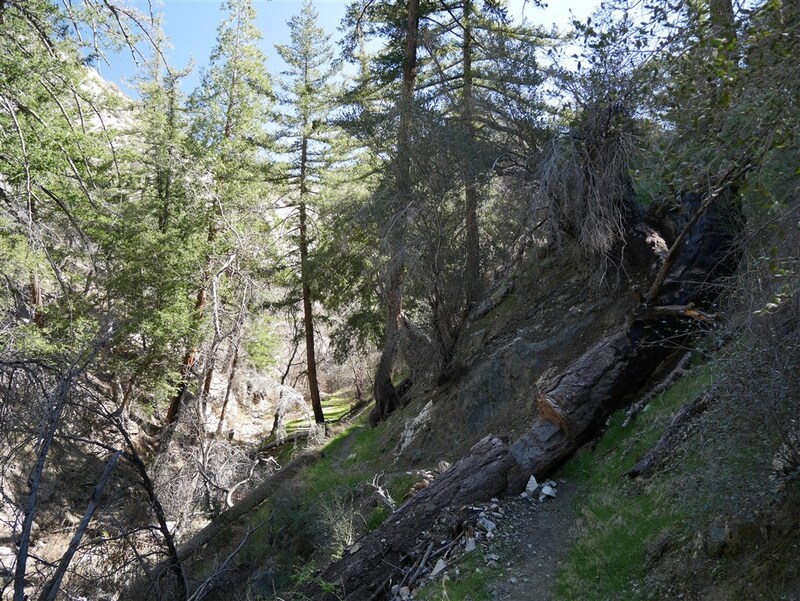 Since my last trip down the canyon, the trail to the camp has received some maintenance, poodle dog bush is now almost completely gone, and forest re-growth has greened the landscape noticeably within the burn areas. 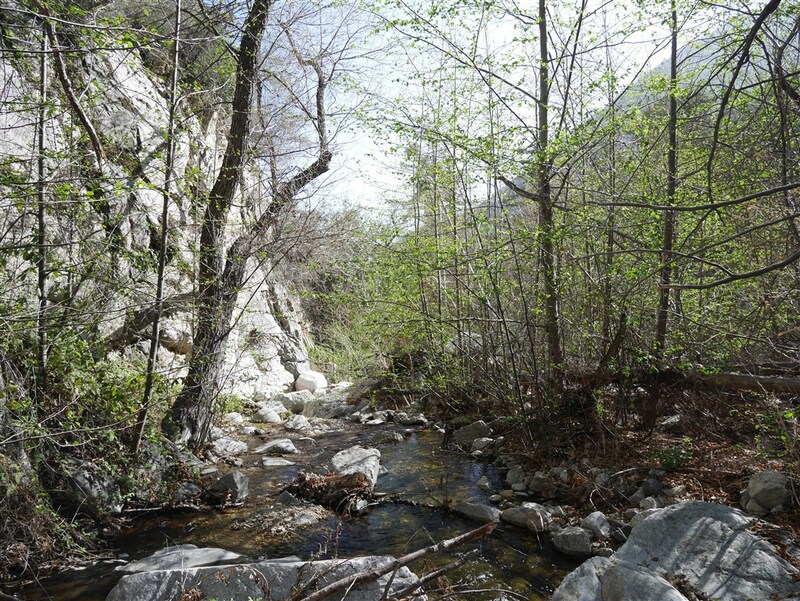 The short hike down Devil’s Canyon to the camp is easy to follow and is often shaded and next to a stream (at least early in the year) for a significant portion of the journey. Moving beyond the trail camp quickly becomes arduous and slow going. Before long, the trail is overgrown to varying degrees and often temporarily disappears completely to later reappear and disappear again downstream at varying levels of clarity 2. At times, the only obvious way forward is to walk through the stream until another way becomes apparent. Fallen trees and other fire-related debris from the Station Fire of 2009 also obstruct the way through the stream in many areas making the route forward a continuous exercise in trying to determine the path of least resistance–east bank, west bank, or stream. 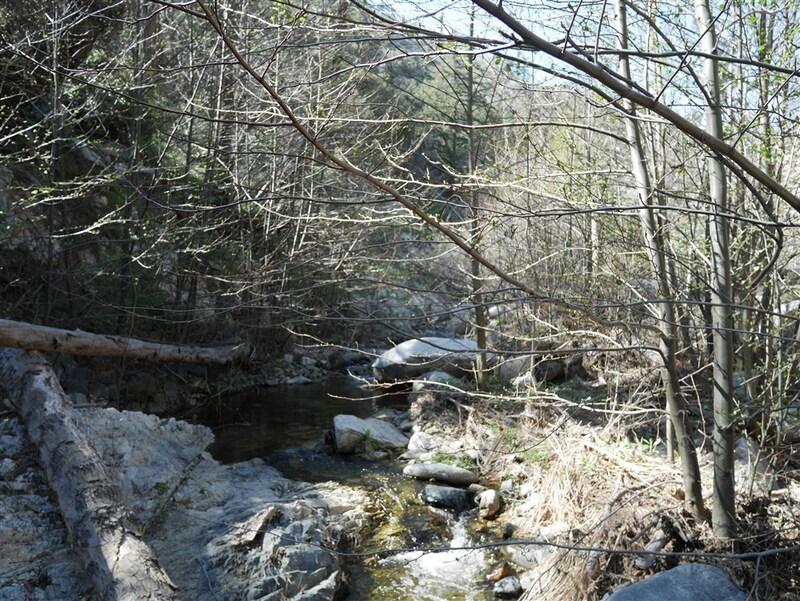 One of the many areas along the stream obstructed with fallen trees and other debris from the Station Fire of 2009. It didn’t take long before I started wondering how far I’d go before deciding to turn back. Often I could hardly go twenty feet without needing to stop and figure out a way to continue. A hundred feet without needing to stop and decide how to move forward became a rare and pleasant circumstance. However, moving forward was made easier than it could have been because someone had gone before me recently enough that the rock cairns of that person’s journey still remained to help guide me. At times, by the water, footprints served to further reinforce the fact that someone else had recently been through this area. Placement of the cairns was often subtle and easy to miss, though often occurring in pairs to more clearly indicate the way, at times as close as a series of ten to twenty foot increments. Still, they aren’t always that easy to spot even when I stopped to search the landscape. I’m sure I missed several. Some are more obvious depending on one’s direction of travel. With few exceptions, moving downstream generally meant more decision points closer together and more problem-solving required to get around obstacles of various kinds. This was especially true as the canyon walls continued to close in. With a much higher level of mental focus required for me to make it through the landscape, my thoughts were more random than usual and some kind of break in concentration was needed to allow my mind to think about other things than just finding my way forward. 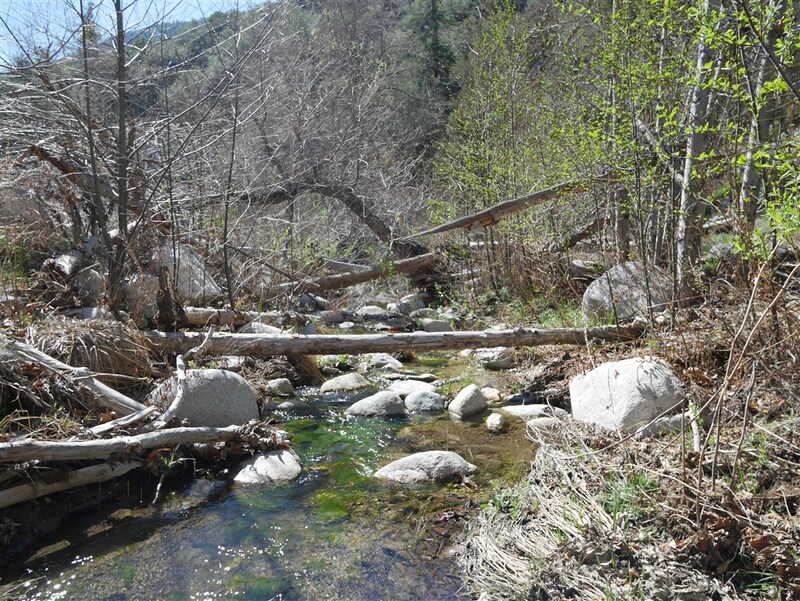 Juxtaposition of the beauty of one of the comparatively ample flowing waterways in the San Gabriel Mountains and the aftermath of an arsonist’s fire cluttering the landscape with debris. The dramatic contrast between the easy way down to the trail camp and the increasingly difficult way forward eventually had me thinking about some metaphorical analogies to Joseph Conrad’s book Heart of Darkness 3. Once my mind started making those connections, more of them continually popped into my head throughout the rest of my journey. Moving past the maintained portion of the trail where most people turn back didn’t lead to a kind of pristine wilderness. While there were many areas where the beauty of the stream dominated the scene, the bulk of the trip involved moving through a landscape profoundly scarred by the darkness of an arsonists malevolent actions–a kind of madness loosely resembling that of Mr. Kurtz. One of the more open and pleasurable spots to be in as I made my way downstream. The further I went away from the trail camp the more helpful the cairns became. I got to a point where it was taking me over an hour per mile to traverse. I would have gone slower without the cairns and definitely would have turned back much earlier. Similar to the help Marlowe received to be able to move deeper into the Congo 4; I was mostly following someone else’s path (when I saw it) and benefiting from that person’s prior knowledge of the trail in it’s more accessible state and/or better ability to plot a course through overgrown terrain. For the first time on a hike, I felt the importance of cairns as a means of helping one find one’s own way back. Although the stream was a dominant feature for guidance, what seemed like countless decision points to move around obstacles generated too many choices to be easily remembered. Without the cairns, it could just as easily take me longer to find my way back. It was also reassuring to know I wasn’t alone in recently traveling this far downstream. The continued presence of cairns and footprints made my goal of reaching the waterfall appear attainable. Periodically making my way through areas of a thickly constrained landscape (closely resembling bushwacking), and arriving at more open and pleasurable spots also motivated me to continue downstream and see what other nice places I would find. That the way forward was so challenging for me made each new spot feel like a reward truly earned. 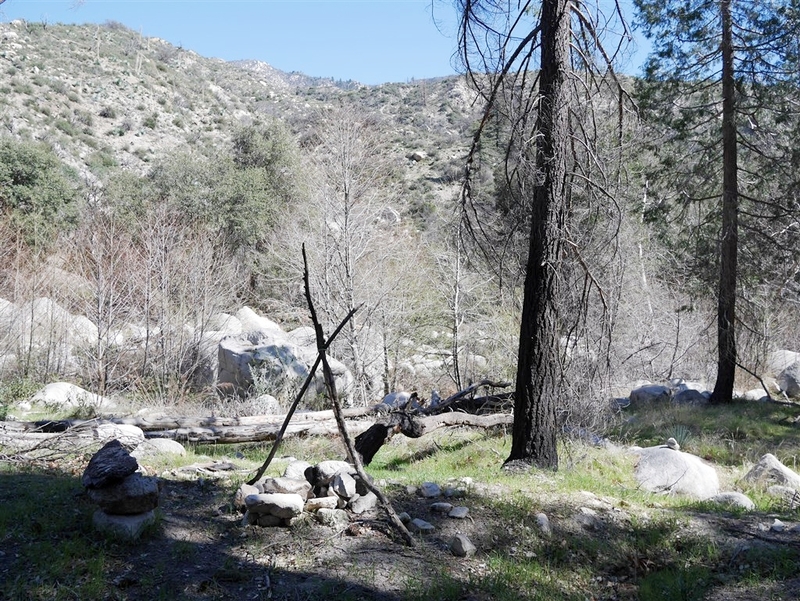 One of the two makeshift sites I came across with some remains of open fires (prohibited for good reason outside clearly designated areas of Angeles National Forest). Arriving at the first of two makeshift sites (possibly camp sites) turned my attention once again to Conrad’s story. The fact that open fire is prohibited in Angeles National Forest outside of designated campgrounds and picnic areas meant that at a minimum someone was unaware of forest regulations related to fire. While I’m sympathetic to not knowing all forest regulations, I think it should be self-evident that starting an open fire in an area so clearly devastated by fire and suffering negative impacts of prolonged drought is, at a minimum, a negligently bad idea. I found these remains disturbing and between the first and second such site I found myself thinking a lot about the madness of Mr. Kurtz and the kind of rationale he developed for his actions. While I don’t know the circumstances or thinking that led the person (or people) to start these fires, I can’t imagine agreeing with their actions. Perhaps that’s unfair. However, as I stood at the second such site, I found myself surprised that I continued to come across things that turned my attention back to the book. View toward the spot where I ate a late lunch before turning back. I never made it to the falls. It was taking me too long to make my way downstream and I wanted to allow myself a little extra time to return in daylight in case I missed some cairns along the way and had to double back in order to proceed (which I did). Also, I had stopped caring about walking through poison oak which was a clear indicator in my case that it was time to turn back. I hate itching and normally would invest the time to more carefully avoid something like poison oak. However, the constant need to find a way forward and the many traverses through dense vegetation (where I ripped a large hole in my backpack) had worn me down both physically and mentally. I needed to save more energy than usual to make it back upstream and out of the canyon. As I sat on a fairly comfortable boulder eating a late lunch I wondered whether the trail would once again be maintained to a more idyllic level as described by Schad. I wondered what the water level was like here in years when California isn’t suffering from extreme drought. Then, my mind wandered back to Heart of Darkness for one last metaphorical connection. Conrad’s story was also about the broad cultural enterprise of imperialism and its role in influencing the specific actions of the characters involved. I thought about how the answers to many of my questions about the health of the forest (e.g. 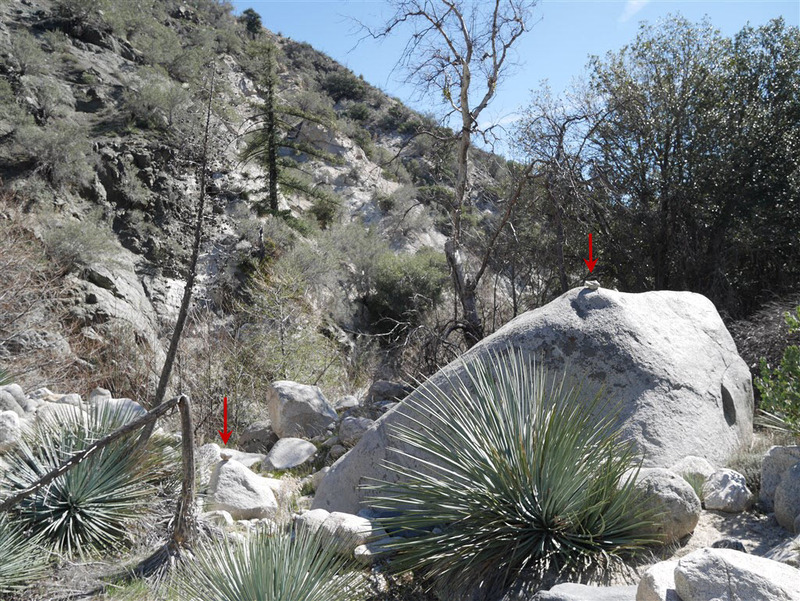 water levels and the prospects for long-term regrowth before the next fire) are tied to the consequences of anthropogenically induced climate change. I thought about that off and on until I made it back to the trail camp. From that point, the way back up the maintained trail out of the canyon was very easy compared to the terrain I’d been hiking through for the past several hours. Once again being on the maintained part of the trail, greener and easier to hike than last I saw it, my thinking moved to the positive things happening in the forest and things that at least have the potential to mitigate our anthropogenic impacts on climate. After putting on my headlamp for the last half mile to the car, I thought about the interplay between the landscape and what is going on in one’s mind and how that impacts the nature of a hike. I won’t forget about this one or what I was thinking about on it anytime soon. This entry was posted in Hiking, Landscape Photography, Literature and tagged Devil's Canyon, fire, Heart of Darkness, Joseph Conrad by Kyle Kuns. Bookmark the permalink.